I have known about birthday freebies for some years now. But recently I decided to investigate further and find out just how many freebies were waiting to be claimed. I was blown away with the seamless endless list of food, drinks, and other items available. 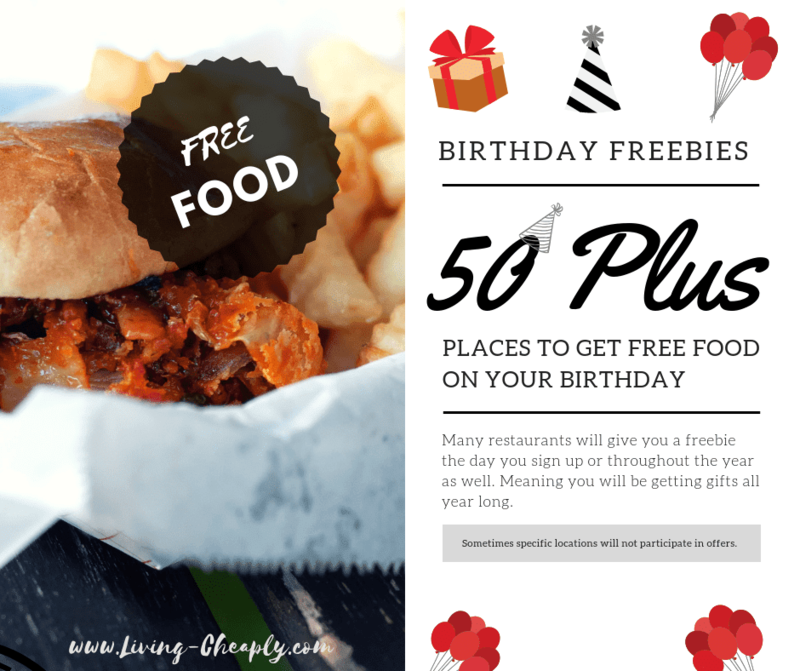 As an added bonus signing up for many of these freebies give you more than just freebies on your birthday. Many restaurants will give you a freebie the day you sign up or throughout the year as well. Meaning you will be getting gifts all year long. Always ask you never know. Our list contains more than 50 places to get free food on your birthday. However, I have learned over the years it's best to always best to ask any restaurant you're visiting on your special day. They will almost always have a free item of some sort for Birthday boys and girls. Just because they do not publish it does not mean they don’t offer anything. Sign Up at least a few weeks in advance of your birthday. Quite a few of these deals require you to sign up at least a week or so ahead of your special day. Often that's because the deal will be delivered to your email and it just takes time to process. Create a special email for your special day. Most of these deals will require you to sign up for the companies email list. This means you may see a rise of email cluttering up your inbox. The solution is to create an email just for these offers. Not only does this prevent the clutter but also makes it easy to keep track of your deals. Usually, most of your coupons will be delivered by the first of the month that your birthday is in. Making it easy to collect all your gifts at one time. Sometimes NOT ALL locations will offer the same deals. Sometimes specific locations will not participate in offers. When the same business across town will. Usually, it's not an issue but it does happen. Gift: Free dessert on your birthday with the purchase of an entree. Requirement: You must join their email club in order to receive your dessert on Applebee's. Gift: On your birthday you will receive one free milkshake. Requirement: You must register with Arby’s in order to get your milkshake. Gift: A Coupon on your birthday for your choice of sandwich or salad for free. Requirement: You must join Au Bon Pain eClub and become a member. Gift: A free classic pretzel. Requirement: You must become a My Pretzel Perks Member. Gift: Two free gifts this time! One scoop of ice cream for free on your birthday. As well as a discount on a birthday cake if you decide to treat yourself. Gift: Some shops will give you a free scoop of ice cream! Plus exclusive birthday coupons such as discounts on birthday cakes. Requirement: Customers must sign up for the newsletter to get their free ice cream and coupons. Gift: $30 gift certificate on the house to use anytime during the month of your birthday. Requirement: Customers must join the Chef’s Table club in order to receive their gift. Requirement: Customers must become Prime Club members for their free steak dinner. Gift: A Bo-Berry biscuit on the house with any purchase on your birthday each year. Plus a FREE 1/2 gallon of Legendary Iced Tea just for signing up. Requirement: Customers must sign up for Bojangles E-Club, for their free Bo-Berry Biscuit. Gift: Your choice between Bang Bang Shrimp appetizer or Jen’s Jamaican Coconut Pie. Either way, you win in my eyes. Requirement: In order to be able to make this wonderful choice you must be a BFG Insider. Gift: A random coupon to use toward your meal for your birthday. Requirement: Customers must join the Blazin Rewards club in order to receive their free coupon. Gift: A birthday dinner of your choice on your special day. Requirement: Customers must join Join D's club at Captain D's in order to receive their free meal. Gift: A free entree on the house up to $12.99 in value. Requirement: In order to receive your free entree you must Join their e-club. Gift: This one requires you to make a purchase to get your freebie. It is a buy one and get one free coupon for a blizzard. But who doesn’t have a friend who wants a blizzard? Or maybe just have both? Requirement: Customers must be members of the Blizzard Fan Club. Gift: A Grand Slam on the house for free. Requirement: You can sign up for Denny’s loyalty program for this freebie. Also, you may be able to just show your id to your waiter so they really know it's your birthday. Gift: This one gives you two free gifts! A medium drink as soon as you sign up. Plus a second free drink on your birthday. Requirement: Customers must sign up for DD Perks to receive their two free gifts. Gift: A dessert on the house with the purchase of any adult entree. Plus a coupon for a free spaghetti just for signing up. As well as many other coupons and discount all year long. Requirement: Customers must join Fazoli’s eFamily Club to get their free spaghetti and birthday freebie. Gift: One free medium sub on the house. Requirement: Customers must sign up for Firehouse Rewards to get their free sub. Gift: Coupons and specials deals on your birthday. Requirement: You must join Fuddruckers Fudds Club for this gift. Gift: A certificate for 10 boneless wings on the house for your birthday. Requirement: Customers must become a Hooters eClub member for their boneless wings. Gift: They give you 2 gifts! First one is 10 dollars off a purchase when you sign up. Second is an entrée on the house for your birthday. Requirement: Customers must become a Houlihan’s member for these two gifts. Gift: So we have had a few that give two gifts. How about three?! First is a meal on the house just for joining their eClub. Second is a meal on the house on your birthday. Finally, they give you another free meal on the first anniversary of joining their eClub. Requirement: To enjoy these 3 free gifts you must join Pancake Revolution eClub. Gift: A coupon for tacos on the house during the week of your birthday. A valid ID is also required in order to able to use your coupon. Requirement: Customers must sign up for Jack in the Box Email newsletter to get this coupon for free tacos. Gift: One coupon for a free sub and drink for your birthday. The best part is you will get the coupon when you sign up and it can be used anytime that year. Requirement: Customers must sign up for their email club to get this coupon. Gift: A doughnut and small coffee or drink on the house on your birthday. Requirement: Customers must sign up for Krispy Kreme e-Club to get their free doughnut and drink. Depending on the location you may be able to just show your ID for your doughnut. Gift: A appetizer or dessert on the house for your birthday. (The offer excludes any item that cost over $7.99.) Plus they will send you a 5.00 off 20.00 coupon just for signing up. Requirement: Customers must sign up for Logan’s Roadhouse’s e-Club to get their free doughnut and drink. Depending on the location you may be able to just show your ID for your doughnut. Gift: A dessert on the house for your birthday. Requirement: Customers must sign up for their email club for their free dessert. Gift: A burrito on the house for your birthday. Requirement: Customers must download Moe’s app for their free burrito. Gift: A surprise gift for your birthday. The surprise usually is either a piece of pie or a brownie topped with ice cream. Requirement: You will need to become an O’Club member for your surprise gift. Gift: A free dessert on the house for your birthday. Requirement: Customers must join Olive Garden eClub in order to get their free dessert. Requirement: Customers will need to show their ID for their free dessert. Gift: You will receive a special offer to use anytime during your birthday month. Requirement: Customers must create an account P.F.Chang’s in order to receive their special offer. Gift: A free pastry or drink on the house. Usually, the reward is a pastry but can be soda, tea or coffee as well. Plus you get a free pastry just for signing up for MyPanera. Requirement: You must join their rewards program called MyPanera. To join MyPanera you need a member card which you can get for free at any Panera Bread store location. Or you can sign up online and pick your card up at the store location you choose. Customers can register the card online or at the store location. Gift: You get 10 free Papa Points on the house for your birthday. Currently 10 Papa Points can you either free cheese sticks, garlic knots or a chocolate chip cookie. Of course, the points can also be combined with any other points on your account in order to get more expensive menu items. Gift: You will get a pizza surprise for your birthday. Requirement: Customers must create a MyPizzaExpress account to get their surprise. Gift: A coupon for a free meal on the house. For example in the past customers have gotten free Cinnamon Sticks or Cheese Sticks. Requirement: Customers must sign up to be a Hut Lover to get their free surprise. Gift: A treat on the house for your birthday. In the past, the treat has been a BOGO coupon for an entree or a free cookie. Requirement: Customers must join Qdoba Rewards in order to get their free treat. Gift: A coupon for a surprise gift to use on your special day. Requirement: You must join the My Red Lobster Rewards at least 7 days before your birthday to get your gift. Gift: A burger on the house on your birthday. Plus other free items and rewards for being a frequent customer. Requirement: Customers must become a Red Robin Royalty member to get their free burger and other gifts. Gift: A treat on the house for your birthday. Plus offer discounts during the rest of the year. Requirement: Customers must Join Rita’s Birthday Club in order to get their treat. Gift: A burger or garden bar entrée on the house for your birthday. Plus customers get a free appetizer when they become members. Requirement: Customers must sign up for the So Connected plan in order to receive these free gifts. Gift: A coupon for BOGO adult dinner buffets on your birthday. Plus another coupon to be used within 14 days of receiving the coupon. Requirement: Customers must sign up for a Crave Connection account in order to get their free BOGO dinner buffet coupons. Gift: A slice of cheese or pepperoni pizza on the house with the purchase of a drink. to get their free slice of pizza. Gift: A surprise treat on the house for your birthday. They used to allow you to choose your surprise from multiple options. Now its just whatever they decided to give you. Which changes from time to time. Requirement: Customers must join My Sonic in order to get their Sonic surprise gift. Gift: A Big Deal Combo Meal on the house for your birthday! The meal includes a sandwich, fries, and a drink. Plus you get a $5.00 off coupon just for joining. Requirement: Customers must join Sonny’s BBQ eClub in order to get their free Deal Combo Meal. Gift: A drink or treat on the house for your birthday. As well as 15% off along with other many perks. Requirement: At least 30 days before your birthday you must register a Starbucks prepaid card with My Starbucks Rewards. Gift: A coupon for a Double Cheese Steakburger with Fries on the house for your birthday. Requirement: Customers must sign up for Steak 'n Shake eClub in order to get their coupon for a Double Cheese Steakburger with Fries. Gift: A appetizer on the house plus a birthday surprise gift. Requirement: Customers must sign up for the Texas Roadhouse email club to get their Free appetizer. Requirement: Customers must have a Fridays Rewards plan to get their free dessert. Gift: A entrée on the house plus promotional offers. Requirement: Customers must join Tony Roma’s email club in order to receive their free entrée. Gift: This freebie is a bit random. It may be anything from a discount off your purchase to a Free personal pizza on the house. Requirement: Customers must join Uno Insider’s Club in order to receive their random freebie. Gift: A waffle on the house on your birthday. Requirement: Customers must join the Waffle House Regulars Club in order to receive their free waffle. Gift: A free coupon for $1.00 off any premium combo. I would not recommend this one unless you really love Wendy's. In that case, a dollar is a dollar right. Requirement: Customers must sign up for Wendy's newsletter for their $1.00 off coupon. Gift: A nibbler on the house for your birthday. Don't know what a nibbler is? It's basically a small chicken sandwich. Customers also get a free meal just for signing up. Requirement: Customers must become a member of Zaxby’s Zax Mail Club in order to receive their free nibbler and meal. I hope you guys found our list to be helpful! If you guys know of any other freebies that you believe we should add to our list please comment below and let us know. Thanks for reading and Happy Birthday!